I did some recent testing on renamer tools and this and Advanced Renamer turned out to be the most flexible, especially when it came to command-line support. I looked into the undo feature of AR, but I thought it undid changes only on an error. Guess I was wrong about that. Will look into that again. Anyway, I mostly use the Bulk Rename Utility command-line now. Many of the other renamers have become outdated. This is also good. The advantage of Advanced Renamer is that I can undo the changes even after closing the program. @ spchtr: Changelog says "V3.1" and rightklick->properties->version on RenameMaster.exe gives me V3.1.0.2398 ... so I call it "V3.1". Not finding a 3.1 there. there's a 3.0.1 though. Dunno about all this add stuff though. Looking for something else as easy to use. What I meant was: could write just one .ini. That's too much files compared to equivalent apps. Above link does not work. You have to disable your adblocker. So it's not really freeware for me. There are other renaming tools like this on the market. Forget it. Couldn't figure out how to rename files based on the Year in an MP3 tag, or to do a mass rename of an Album Title tag. It has a few foibles, like wiping out my customized columns when refreshing the page view after a mass rename action. It's been updated to "2.9.0"
Great Utility... I would like to ask Technomancer why in the world he is playing on the DB server then? Smart thinking makes the world go around! Well, I just started using it. It didn't take me long to find the options that I want to use, (EXIF and MP3 Tags), BUT, it would be helpful if there was a 'built in' help page. I sometimes use a PC that isn't connected to the internet, Yeah that might seem strange, but I do work with 'sensitive' databases and a legal requirement is that the computer with the databases must NOT be connected to the internet or a network. I digress. A 'built in' help page/file would be great. Such a useless tool when you have TotalCommander. I tried it because there was one thing TC can't do in renaming matters: Rename folders (not files) recursively. Rename Master doesn't offer that either. So no need for it here. The best renaming utility ever BUT the 2.7.6 version was the last simple one. Current releases hurts eyes with changed GUI and very bad controls positioning. I had thought that it is impossible to author to make this tool bad but he did it. I understand the greed for icons but it doesn't explain why elements alignment is so inconsistent and takes so much space. Simplicity has been killed. I've tried just about every file renaming utility out there and this one is THE BEST - and FREE, too ! Keep up the great work ! I've been using this program for awhile and it is a great program. Has every possible way I can think of to rename files. Lets you remove,replace,add,insert, capitalize, etc... It contains a real-time preview of all your changes as you select them so you can determine if it is the right option, and has an undo feature as well if you make a mistake. 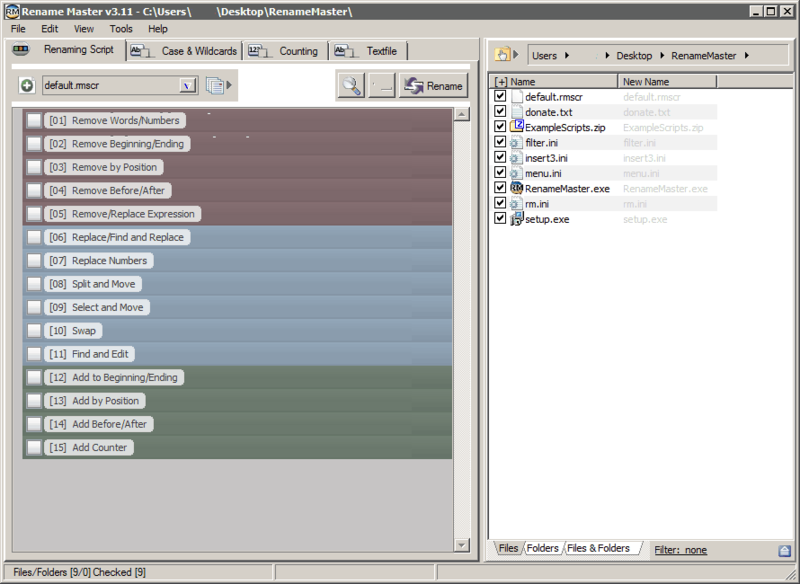 I havnt even used all the features built-in to this program as it contains many. Very usefull program for me.